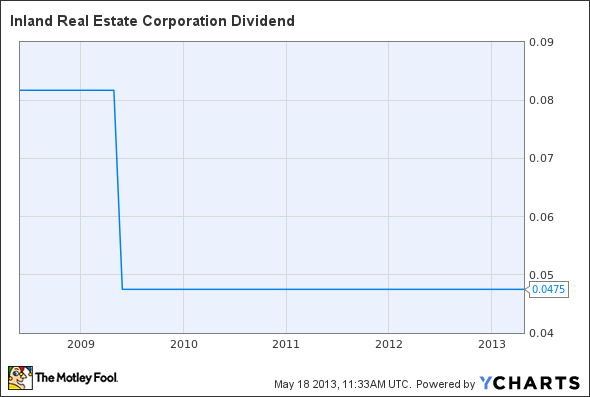 REIT has made the same monthly distribution for the past four years. Real estate investment trust Inland Real Estate (UNKNOWN:IRC.DL) announced yesterday that it set its monthly disbursement for June at $0.0475 per share, the same monthly rate it's paid for the past four years. The board of directors said the monthly dividend is payable on June 17 to the holders of record at the close of business on May 1. Inland has reduced its dividend payment from $0.0817 during the recession as a means of preserving cash. The regular dividend payment equates to a $0.57-per-share annual dividend yielding 4.9%, based on the closing price of the stock on May 17.